There was no place for Rishabh Pant or Ambati Rayudu in India’s squad of 15 for the 2019 World Cup, but KL Rahul, Dinesh Karthik, Vijay Shankar and Ravindra Jadeja all found places. Ambati Rayudu and Pant were among the contenders for the spot, but the selectors seem to have placed their faith in Karthik, with Rahul and Vijay Shankar marked as alternatives if required. Why Karthik and not Pant was the big question directed at Prasad in the press interaction that followed the squad announcement. “It’s definitely a case where we have debated at length and all of us, in unison, felt that either Rishabh Pant or Dinesh Karthik will only come into the playing XI if MS Dhoni is injured. So, at that juncture, if it is a crucial match, like a semi-final or an important game, wicketkeeping also matters,” Prasad replied. “So under such situations, in crunch matches, who is the best guy who can handle the pressure? That is the reason that went in favour of Dinesh Karthik. Pant is full of talent. There’s a lot of time for him. It’s just unfortunate that he’s missed out. When it comes to the No. 4 debate, Kohli had backed Rayudu for the job back in October last year. In 20 innings since his comeback to the India ODI side in September last year, Rayudu had batted at No. 4 on 14 occasions, scoring 464 runs at an average of 42.18 and a strike rate of 85.60. He played only two ODIs on the tour of Australia, but was the highest run-getter for India in the ODIs on the tour of New Zealand, with 190 runs in five innings at an average of 63.33 and a strike rate of 82.25. 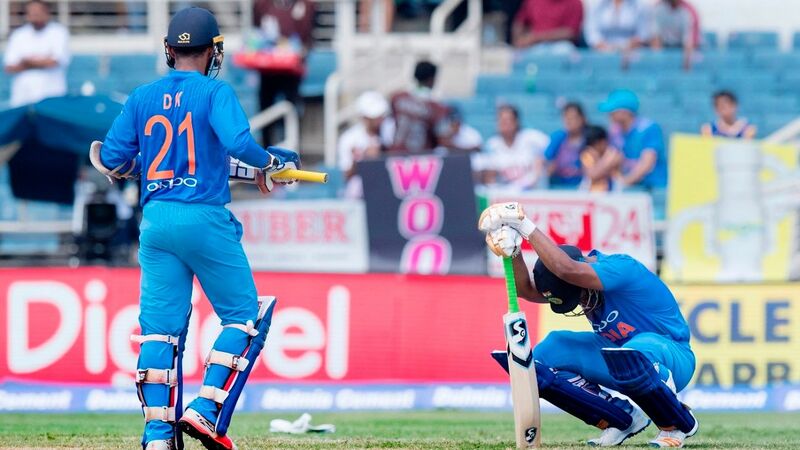 His form against Australia at home, however, was poor, and that, Prasad explained, titled the scales in favour of the others, notably Vijay Shankar, who, incidentally, has never batted at No. 4 in ODIs. “After the Champions Trophy (2017), we have tried quite a few middle-order batsmen, which also includes Dinesh Karthik at that order, and we also tried Shreyas Iyer and Manish Pandey. We did give a few more chances to Rayudu but what Vijay Shankar offers is three dimensions: apart from his batting, he can bowl; if the conditions are suitable, overcast, which we might encounter in England, he might bowl a bit and he’s a fantastic fielder,” Prasad said. On the bowling front, India have two frontline spinners – wristspinners Kuldeep Yadav and Yuzvendra Chahal – along with three out-and-out fast bowlers in Jasprit Bumrah, Bhuvneshwar Kumar and Mohammed Shami, plus three allrounders: Ravindra Jadeja, Hardik Pandya and Vijay Shankar. Are three spinners – not to forget Kedar Jadhav – too many considering the conditions in the UK? Form in the IPL, as Kohli had hinted before the tournament began, was not considered, Prasad clarified. He also said that there wouldn’t be any changes to the squad – the final deadline is May 23 – unless there’s an injury, and the Indian team management had been in touch with the eight IPL franchises to monitor players’ workloads. But, especially in the case of the fast bowlers, of whom India have only three, some reserves had been identified: “Yes, Khaleel Ahmed’s name also came up for discussion. Along with him, we also discussed (Navdeep) Saini. So they will be in and around, and if the need arises, definitely one among them will get picked,” Prasad said, adding that a pack of four reserve pacers would be travelling with the team.